This pattern started out to be an earring tutorial - I saw a gorgeous bird's-eye view picture of the tower of the Chrysler building, with its luscious Art Deco curves and lines, and was inspired to play with my new Arcos Par Puca 3-hole crescent beads and see if I could recreate those curves and lines! 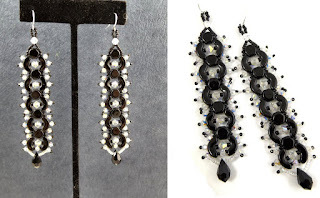 This tutorial is extremely versatile - you can make the earrings long or short, give them fringe or no fringe, add dangles or no dangles, and put crystals in middle of the pairs of crescents or leave that space open. You can use Swarovski crystals or firepolish beads, or even metal bicones - tons of options! 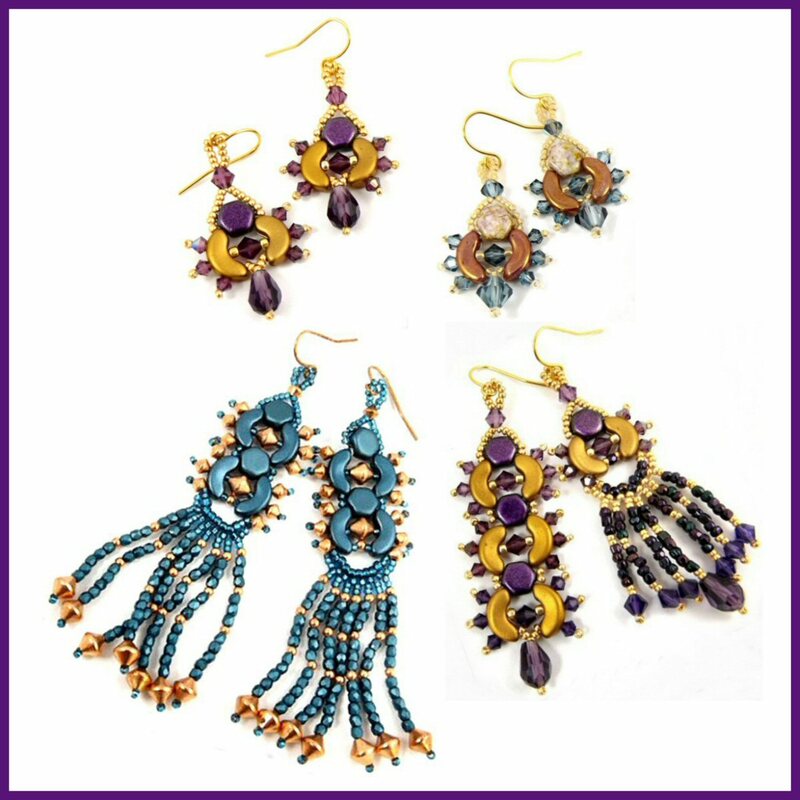 Just a few of the different earrings in this tutorial. The pair on the left have crystals inside the crescent pair, while the pair on the right do not. Horrible pics, but trust me; these are beautiful! I draped one of the long black earrings on the back of my hand, admiring it, and thought: Wow, this would make a great bracelet! 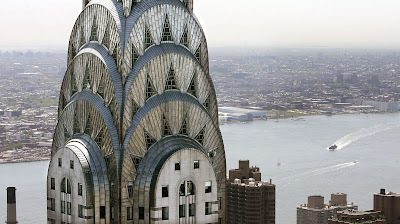 So there you have it: Deco Love. 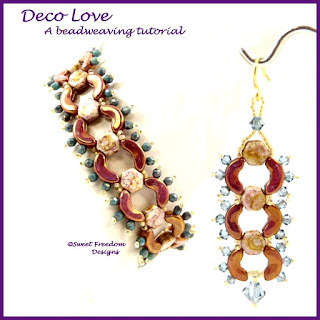 In addition to the Arcos Par Pucas, it calls for Honeycombs, 3 and 4 mm crystal bicones or firepolish (in the bracelet, I actually substituted True2 mm firepolish, to make it extra dainty), 15/0s, 11/0s, and optional dangles for the earrings. It's available here, in my Etsy store! 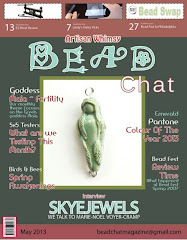 I'm a jewelry designer, with a passion for the eclectic, and for bead-weaving. I left the corporate rat-race in mid-2007 to pursue my love for jewelry design full time, and Sweet Freedom was born! Visit Lesley's profile on Pinterest. Copyright is reserved on all images and text generated by Sweet Freedom Designs. Copyright is retained by the originator for all images and text generated by others and used with their permission or within the context of 'fair use'. I want you to enjoy my photographs and descriptions, but please do not equate the presence of large, clear photographs of my creations, my creative process, and my life with permission to copy them. It is NOT. Please contact me if you wish to copy and use any text or images for publication elsewhere; copying for commercial use is subject to license and a fee.